Directions (1 -5): Read the following information carefully and answer the given questions. Shivani, a saree seller bought 720 sarees of 3 different types (S1, S2 and S3) in the ratio 4: 5: 3. She sells the sarees based on market demand. On the 1st day he sells 10% of the total volume. On the 2nd day she sells (40/3) % of the total volume. On the 3rd day she sells (35/3) % of the total volume. On the 4th day she sells 20% of the total volume. On the 5th day she sells 33(1/3) % of the total volume. On the 6th day she sells the same volume on the 3rd day. 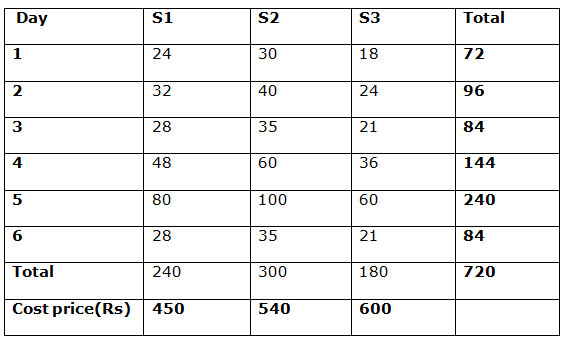 The cost of each S1, S2 and S3 sarees is Rs. 450, Rs. 540 and Rs. 600 respectively. On each day she sells the sarees of each variety in the same ratio as she bought. 1. If on the 3rd day she sells S3 saree for a price which is more than 20% than their cost price whereas the other two sarees are sold at their cost price, then find the total amount received by Shivani by selling the sarees on the 3rd day? 2. If on the 4th day she marks up 60% for all the three type of sarees and allows 20%, 15% and 18% discount on S1, S2 and S3 type sarees respectively. Find the total amount received by Shivani by selling the sarees on the 4th day? 3. Total S1 type sarees sold on the 2nd, 3rd and 4th day is what percentage more/less than the total S3 type sarees sold on the 1st, 5th and 6th day? 4. In which of the following day the amount received by Shivani is maximum if all the sarees sold the same as cost price? On 5th day, Shivani received the maximum amount. In which day she sold maximum sarees on that day she received maximum amount. From the above information, we could find 5th day she received maximum amount. 5. It is known that 25% of the sarees were slightly damaged. If Shivani managed to sell the sarees which were slightly damaged at 20% loss, then find the amount made by Shivani for selling the damaged sarees on the 2nd, 4th and 5th day. (Consider the ratio of the damaged sarees in the three categories is same as the ratio which she bought)? Directions (6 -10): A number is bolded in the series I, II and III. Find the wrong series which does not satisfies the given number and choose the options accordingly. Directions (1 -5): Read the following information carefully and answer the given questions. Shivani, a saree seller bought 720 sarees of 3 different types (S1, S2 and S3) in the ratio 4: 5: 3. She sells the sarees based on market demand. On the 1st day he sells 10% of the total volume. On the 2nd day she sells (40/3) % of the total volume. On the 3rd day she sells (35/3) % of the total volume. On the 4th day she sells 20% of the total volume. On the 5th day she sells 33(1/3) % of the total volume. On the 6th day she sells the same volume as on the 3rd day. The cost of each S1, S2 and S3 sarees is Rs. 450, Rs. 540 and Rs. 600 respectively. On each day she sells the sarees of each variety in the same ratio as she bought. 1) If on the 3rd day she sells S3 saree for a price which is more than 20% than their cost price whereas the other two sarees are sold at their cost price, then find the total amount received by Shivani by selling the sarees on the 3rd day? 2) If on the 4th day she marks up 60% for all the three type of sarees and allows 20%, 15% and 18% discount on S1, S2 and S3 type sarees respectively. Find the total amount received by Shivani by selling the sarees on the 4th day? 3) Total S1 type sarees sold on the 2nd, 3rd and 4th day is what percentage more/less than the total S3 type sarees sold on the 1st, 5th and 6th day? 4) In which of the following day the amount received by Shivani is maximum if all the sarees sold the same as cost price? 5) It is known that 25% of the sarees were slightly damaged in each day. If Shivani managed to sell the sarees which were slightly damaged at 20% loss, then find the amount made by Shivani for selling the damaged sarees on the 2nd, 4th and 5th day. (Consider the ratio of the damaged sarees in the three categories is same as the ratio which she bought)?